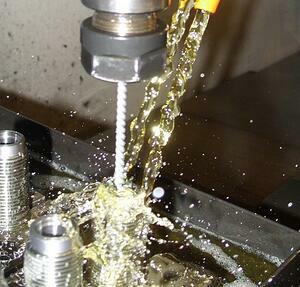 Deburring cross-drilled holes can be an expensive, difficult, and time-consuming operation. Without proper cross-hole deburring, however, part misalignments can occur. Personnel who handle these machined metal parts also face the risk of injury from ragged edges, raised areas, and sharp surfaces. 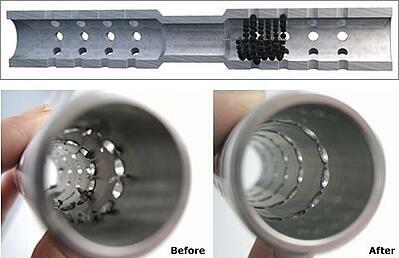 For fast, efficient, and effective cross-hole deburring, part manufacturers and machinists trust the Flex-Hone® tool. Made in the USA by Brush Research Manufacturing (BRM), the Flex-Hone® removes burrs from cross-drilled holes and improves cylinder surface finish at the same time. The BRM Flex-Hone® requires no special training or instruction, but there are some best practices to follow on your way to surface finishing success. Standard Flex-Hone® tools are available for bores with diameters from 4-mm to 36”. To produce a soft cutting action, BRM supplies flexible hones in a slightly oversized condition. In other words, a 3” Flex-Hone has a tool diameter that’s larger than 3”. With cross-drilled holes, this allows the Flex-Hone® to pop out and into the intersection, removing burrs and creating a radius at the transition edge. During cross-hole deburring, and with any Flex-Hone® operation (such as cylinder wall deglazing), it’s important to use a good-quality honing oil. This prevents tool loading, and ensures the exposure of fresh cutting particles. For best results, choose Flex-Hone® oil – BRM’s own special blend of honing and lapping oils with a special additive that helps keep the metal cuttings and contaminants in suspension. Flex-Hone® tools have a wire stem that supports the tool’s use with most any rotating spindle. With CNC equipment, the flexible hone is secured with a Jacobs-style collet that’s clamped directly onto the stem wire. BRM’s cross-hole deburring tools can also be used with lathes, mills, drill presses, robotic work cells, and handheld electric drills. When deburring cross-drilled holes with Flex-Hone®, BRM recommends that you first stroke and rotate the tool in a clockwise direction. Then remove the flexible cylinder hone from the bore, reverse the spindle, and stroke and rotate in a clockwise direction. This promotes a more symmetrical deburring pattern and prevents burrs from folding back into the cross-hole. Finally, follow the recommendations in the Flex-Hone® Resource Guide – the ultimate source of information about Flex-Hone® selection and use. This free, full-color technical publication from BRM covers everything from abrasive and grit selection to power requirements and recommended RPMs.